On Saturday morning, July 18, 2015, around 10:00 a.m., our Sister Agnes O’Keeffe died in her room at Maryknoll, New York, in the presence of her ever-attentive sister, Ann. Sister Agnes was approaching her 91st birthday and had been a Maryknoll Sister for 58 years. Agnes Vera O’Keeffe was born on August 12, 1924, in St. Boniface, Manitoba, Canada, one of seven siblings born to John Michael and Lucy Chatfield O’Keeffe. She had four sisters, Mary Grace and Kathleen O’Keeffe, Mary O’Keeffe Goderis, and Anne O’Keeffe and two brothers, David and John O’Keeffe. We are pleased and grateful to have Ann and Pat with us today. Agnes completed primary and secondary schooling in St. Boniface, graduating from the Holy Names Sisters’ School, St. Joseph’s Collegiate Institute, in 1943. She entered the school of nursing at St. Boniface Hospital in 1944, earning a diploma as a Registered Nurse in 1947. She remained working at the hospital for three years, then briefly in Pierre, Manitoba, before moving to North Dakota, in the United States. 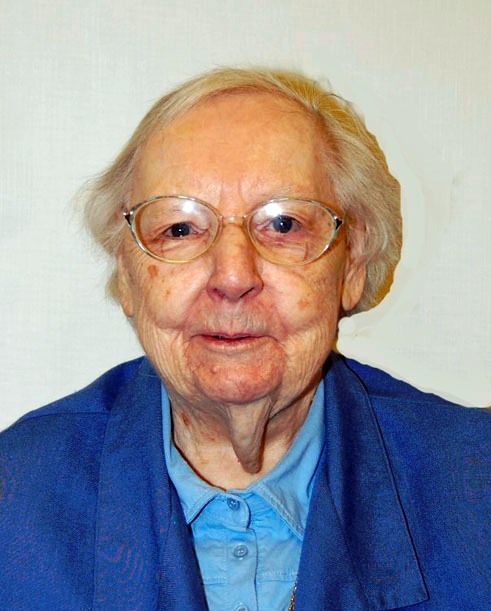 She worked for a year in St. Andrew’s Hospital in Bottineau, North Dakota before going to Minot, North Dakota in 1952, to serve as a faculty member at Trinity Hospital in Clinical Teaching and Supervisor of Medicine until 1956. In 1956, Agnes fulfilled her long-held desire to become a Sister when she entered the Maryknoll Sisters from Holy Cross Parish, Norwood, Manitoba on September 2 of that year. At her reception into the Maryknoll Community, she received the religious name of Sister Agnes Miriam. She pronounced First Vows on June 24, 1959, at Maryknoll, New York. She made Final Vows on June 24, 1965, in Guatemala, Central America. Her first assignment was to Bethany House for one year, the first of several times she would apply her nursing skills to the care of our own Maryknoll Sisters. Her first overseas mission assignment was to Guatemala in 1960, beginning language school in September of that year. In March 1961, she went to San Miguel Acatan, Huehuetenango, where she organized and attended the first clinic in the parish. During this period, she made and retained many friends for life. In 1968, she returned to Bethany House for a year and then worked for a year as a Pediatric Staff Nurse in Bronxville Memorial Hospital to update herself in Pediatric Clinical Practice. From 1970 to 1972, she attended Boston College where she earned a BS degree with a major in nursing and a minor in sociology. Following graduation, she gave another year of service at Bethany. In 1973, Agnes received her second overseas mission assignment, this time to Tanzania, East Africa. She studied the Swahili language in Musoma, Tanzania, and proceeded to Nymwaga Parish, Bwirigi, in the Musoma Diocese. She became Administrator of the clinic there, specializing in therapeutic treatment and disease prevention, along with teaching local health workers. In 1989, Agnes did a three-month study period in Jerusalem in biblical formation. While in Jerusalem, she received the news that Our Lady of Kilimanjaro African Sisters had arrived in Nymwaga parish to continue her work. Agnes took great pleasure in seeing African Sisters and priests slowly taking over Church leadership. Early on in her African mission, when her Maryknoll companion was taken ill, Agnes had shared life in community with African Sisters for four years. In January 1989, a new Bishop of Musoma was consecrated whom Agnes had known as a seminarian in 1973 when she first arrived in Tanzania. Following her studies in Jerusalem, Agnes returned to the Maryknoll Sisters Center to give nursing care for three years. In June 1993, she returned to Tanzania, serving as Medical Supervisor for three hundred boarders at Kowak Girls Secondary School. In 1995, she left this work to administer the Maryknoll Sisters’ African World Section House in Nairobi, Kenya. She came home on medical leave in 1997, and was assigned to the Rogers Community in 1999. She was a volunteer in health care and on the Pastoral Care Team until she retired in 2006. She joined the Eden Community at the Center in 2011. For her Prayer Ministry Sister Agnes had chosen to pray for the sick in the Maryknoll Family and in our personal families. Throughout her missionary life, Agnes distinguished herself as an exceptionally capable nurse in any situation and often as a good diagnostician, quick to notice symptoms. She felt that the hand of God was in her first assignment in Africa so that she could be there to care for her companion, Sister James Florence Blanchard, when the later suffered a severe stoke. Medical personnel in Musoma were amazed at the quick recovery Sister was making, enabling Agnes to accompany her back to Maryknoll. On the third floor where Agnes lived, she characteristically made good friends with those around her, particularly the nurses and aides who attended her and who cried at her loss. We express our gratitude to them for their care of Agnes over these last years. We are pleased to have with us this morning two of Agnes’ close friends and former missionary companions, Fr. Ed Moore from Guatemala and Fr. Ed Hayes from Tanzania, who will preside at the liturgy of Christian burial.